As schools declare that they are confiscating fistfuls of the device from young smokers, Juul Labs, the maker of the most popular e-cigarette on the market, is under fire. The Food and Drug Administration said Wednesday it was cracking down on e-cigarettes, giving manufacturers two months to prove they can keep their devices away from minors. Here is a primer on vaping, the act of inhaling vapors from an e-cigarette. An e-cigarette is an electronic device that heats a liquid cartridge and delivers vapors containing nicotine to be inhaled into the user’s lungs. There are a variety of devices. Some look like actual cigarettes, while others are shaped like everyday items such as computer thumb drives. E-cigarette liquids are not strictly regulated by the FDA. They typically contain varying compositions of nicotine and flavorings from mint to mango, different oils such as propylene glycol or vegetable glycerin, and other ingredients. In most states, the minimum age to buy e-cigarettes is 18. In many Massachusetts municipalities, the minimum age is 21. In typical e-cigarettes, puffing activates the battery-powered heating device, which vaporizes the liquid, often called “juice” or “e-liquid,” containing nicotine. The person then inhales the resulting aerosol or vapor. 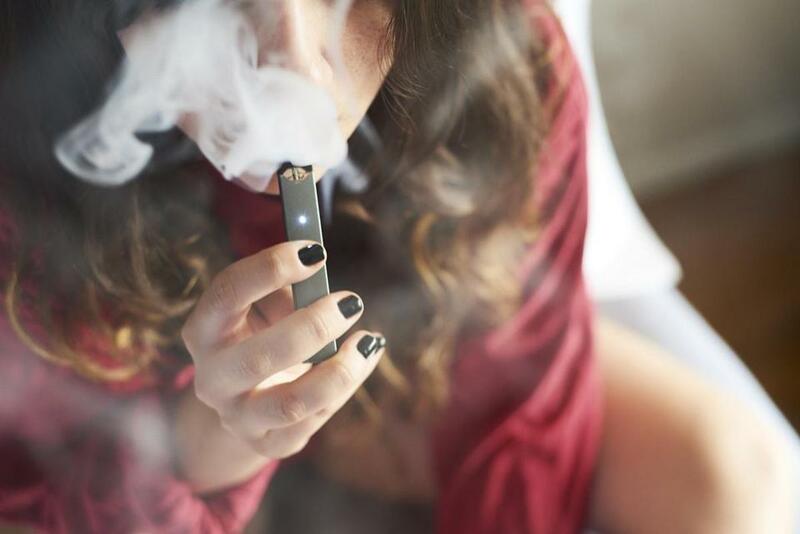 One of the most popular devices, Juul, has two main components: the body with a battery and heating element, and a disposable “pod” filled with nicotine salt suspended in a flavored liquid. Juul pods pack between 23 mg and 40 mg of nicotine and deliver more than 200 puffs each. As with actual cigarettes, part of the draw of e-cigarettes may be the increased alertness and sense of relaxation that nicotine induces. The FDA recently called vaping by teenagers “an epidemic.” However, there are different opinions about its effects on health. The difference, the agency said, is that e-liquids generally lack the “deadly mix” of 7,000 toxic chemicals in regular cigarette smoke. According to the CDC, e-liquids can contain cocktails of potentially harmful ingredients, including chemicals linked to lung disease, and heavy metals such as nickel, tin, and lead. Nicotine alone, the CDC said, is highly addictive, toxic to pregnant women and their babies, and potentially harmful to adolescent brain development. A 2011 study by the National Institutes of Health suggested that nicotine may be a gateway drug to others, such as cocaine, in rats because of changes in the brain during addiction. A 2014 Harvard Medical School article suggested that nicotine may have some health benefits and that researchers were testing the benefits in treating Alzheimer’s disease, Parkinson’s disease, attention deficit/hyperactivity disorder, and other conditions.